At its recent World Wide Developers Conference (WWDC), Apple gave developers and the public a preview of the next version of iOS, its operating system for mobile devices such as the iPad, iPhone and iPod Touch. This post will not provide a full overview of all the changes coming to iOS 11, but will instead focus on a few key ones that will have the most impact for people like me who rely on the built-in accessibility of these devices. A public beta will be coming later this summer, and I can’t wait to get my hands on it to start testing some of these new features. For now, this overview is based on everything I have read on the Web (shout out to AppleVis for a great overview of the new features for those with visual impairments), what I saw in the videos available through the WWDC app after each day of the conference, and updates from people I follow on social media who were at the WWWDC (you should definitely follow Steven Aquino, who provided excellent coverage of all things iOS accessibility from WWDC). Smart Invert Colors: In iOS 11, Invert Colors will no longer be an all or nothing affair. The new version of Invert Colors will actually leave the images and video alone with a new Smart Invert option. This fixes a problem I have always had with Invert Colors. Sometimes there is text in a graphic or video that is essential for understanding, but with Invert Colors as it currently exists it can be difficult to read this text. This will no longer be the case with iOS 11 and its new version of Invert Colors. Enhanced Dynamic Type: Dynamic Type has been enhanced to reduce clipping and overlapping at larger text sizes, and Dynamic Type will work in more of the UI for apps that support it. In some areas of the UI where text is not resized dynamically, such as tab bars, a tap and hold on the selected control will show it at a larger size in the middle of the screen. VoiceOver descriptions for images: VoiceOver will be able to detect text that’s embedded in an image, even if the image lacks alternative text (or as Apple calls it, an accessibility description). VoiceOver will also announce some of the items in a photo that has not been described (tree, dog, sunset, etc. 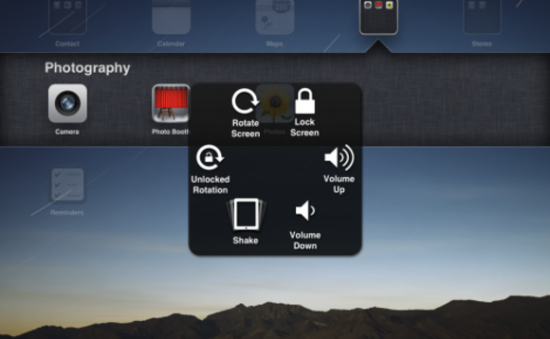 ), much like the Camera app already does when you take a photo with VoiceOver turned on. A more customizable Speech feature: you can now customize the colors for the word and sentence highlighting that is available for Speech features such as Speak Selection and Speak Screen. These features are helpful for learners who struggle with decoding print and need the content read aloud. The highlighting can also help with attention and focus while reading, and it’s nice to see we can now change the color for a more personalized reading experience. Type for Siri: In addition to using your voice, iOS 11 also allows you to interact with Siri by typing your requests. This is not only an accessibility feature (it can help those with speech difficulties who are not easily understood by Siri) but a privacy convenience for everyone else. Sometimes you are in a public place and don’t want those around you to know what you are asking Siri. More options for captions: for videos that include closed captions, you can now enable an additional style that makes the text larger and adds an outline to make it stand out from the background content. Along with this new style, you can now turn on spoken captions or convert the captions to Braille . 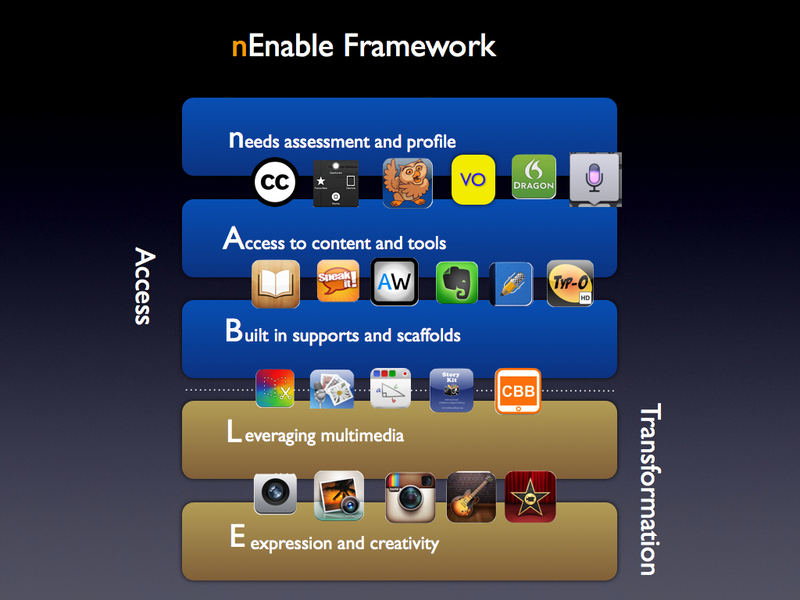 This last option could make the content more accessible to individuals with multiple disabilities. Point Mode has an additional setting for more precise selections: this will add a third scan to refine the selection at an even slower pace, and early reports are that it actually selects the actual point rather than the surrounding accessibility element (button, etc.). Scanner Menu option for Media Controls: recognizing that media playback is a popular activity for switch users (just as it is for everybody else), a new category for Media Controls has been added to the scanner menu. I assume that this feature will work on any app with playback controls, which would make it a great option to use with Voice Dream Reader or any other app with playback controls at the bottom of the screen (which require a lot of scanning to access). Improved PDF accessibility support: while I am not a big fan of PDF as a format, there are still a lot of legacy PDF documents out there so it is nice to see improved support for PDF accessibilty in iOS 11. One of the common uses of PDFs is to collect information through forms, and with iOS 11 Apple promises better support for forms as well as for tagged (properly marked up) PDF documents. Better Braille support: as reported by AppleVis, the Braille improvements in iOS 11 include better text editing and more customizable actions that can be performed through shortcuts on a Braille display. A redesigned Control Center: you will have more ways to get to the features you use the most with the new Control Center, which will now allow you to add widgets for the Accessibility Shortcut, the Magnifier and text resizing. An improved Siri voice: we got a taste of how much more natural the new Siri voice will sound, but there was not a lot of detail provided. It is not clear if this voice will be available to VoiceOver users, or if it will be incorporated into the rest of the Speech features such as Speak Selection and Speak Screen when iOS 11 finally ships to the general public in the fall. Siri translation: Siri can now translate from English into a few languages – Chinese, French, German, Italian, or Spanish. Persistent Reader View in Safari: when you long-press the Reader icon, you can choose to have reader activate on all websites, or just on the current one. Reader view is helpful for removing ads and other distractions that can compete for attention, especially for people with learning difficulties such as ADHD. Apple TV remote in Control Center: It is also possible to add an onscreen Apple TV remote to the Control Center. This will be helpful for Switch Control or VoiceOver users who may prefer this option to using the physical Apple TV remote. One handed keyboard: this option is intended to help anyone who is trying to enter text while one hand is busy with groceries, etc. but it can also be helpful to someone who is missing a limb. Tapping on the Globe icon that provides access to third party keyboards will now show an option for moving the keyboard to either side of the screen where it can be easier to reach with one hand. One handed Zoom in Maps: this feature is intended for drivers to have better access to Maps while on the road, but as with the one-handed keyboard, others will benefit from this change as well. As someone who often has one hand busy with a white cane, I welcome all of these features that make the iPhone easier to use with just one hand. Redesigned onscreen keyboard: Letters, numbers, symbols, and punctuation marks are now all on the same keyboard. Switching between them is as easy as a simple flicking gesture on the desired key. Easier setup of new devices; anything that reduces the amount of time entering settings is helpful to switch and screen reader users. When setting up a new iOS device, there’s now an option in iOS 11 to hold it near an existing device to automatically copy over settings, preferences, and iCloud Keychain. More customizable AirPod tap controls: AirPods can now be customized with separate double tap gestures for the left and right AirPod. One can be set to access Siri, for example, while another can be set to play the next track. Previously, double-tap settings were applied to both AirPods. This will be helpful for individuals who rely on AirPods to access Siri as an accessibility option. Less restrictive HomeKit development: it will now be possible to develop a HomeKit device without being part of Apple’s HomeKit licensing program. All that will be required is a developer account. The catch is that any HomeKit devices developed this way cannot go up for sale. That should be fine for assistive tech makers who just want to experiment and prototype solutions for their clients without the investment required to be part of the official HomeKit program. As The Verge suggests, this could also encourage more developers to dip their toes with HomeKit development, which will hopefully lead to more options for those of us who depend on smart homes for improved accessibility. QR Code support in the Camera: QR codes can be a helpful way to provide access to online resources without requiring a lot of typing of URLS and the like. They are frequently used in the classroom for this purpose, so I know teachers will find having this feature as a built-in option a welcome addition. SOS: There’s an Emergency SOS option in Settings app that allows users to turn on an “Auto Call” feature. This will immediately dial 911 when the Sleep/Wake button is pressed five times. A similar feature has been available on the Apple Watch since the introduction of watchOS 3, and it’s nice to see it on the iPhone as well. Core Bluetooth support for Apple Watch: while this is an Apple Watch feature, I’m mentioning it here because the Apple Watch is still very closely tied to its paired iPhone. With watchOS 4, which was also previewed at the WWWDC, Apple Watch Series 2 is getting support for connecting directly to Bluetooth low energy accessories like those that are used for glucose tracking and delivery. Furthermore, the Health app will have better support for diabetes management in conjunction with CoreBluetooth, including new metrics related to blood glucose tracking and insulin delivery. Indoor navigation in Maps: Maps has been a big help for me whenever I find myself in an area I don’t know. I love the walking directions and how well they integrate with the Apple Watch so that I can leave my phone in my pocket as I navigate with haptic feedback and don’t give off that lost tourist look. With iOS 11, these features will be extended to indoor spaces such as major malls and airports. A redesigned App Store: the screenshots I have seen point to a bigger, bolder design for the App Store, which will be welcome news to those of us with low vision. If you like how Apple News looks now, you will be pleased with the redesigned App Store. Built-in screen recording: I rely on Screenflow to record my video tutorials, but having screen recording as a built-in feature will be convenient for quick videos. This will be great for providing tech support to parents, or for documenting accessibility bugs to developers. Person to Person payments in Messages: anything that allows payments without the need to use inaccessible currency is A OK with me. Instant Markup: adding an annotation to a PDF document or screenshot will be as easy as picking up the Apple Pencil and touching the screen to start drawing/annotating. Instant Notes: tapping the lock screen with Apple Pencil will create a quick handwritten note that will appear in Notes once the device is unlocked. Inline Drawing: when you begin to draw or annotate in Notes, the text around the annotation will move out of the way. You can add inline drawings in Mail as well. Searchable annotations in Notes: everything you write with the Apple Pencil in Notes will now be searchable, making it much easier to find the highlights in long notes taken during a lecture or long presentation. Document Scanner: the new Document Scanner in Notes will detect the edges to automatically scan a document, crop it, and remove glare and tilt to produce a cleaner image. This will result in a better scan you could then pass the scanned document off to a different app to perform even better optical character recognition (OCR). I am hoping this feature is just a start, and eventually we will get built-in OCR in iOS. A major focus with iOS 11 is improved support for iPad productivity. This includes support for Drag and Drop in an enhanced Split View, as well as a new multi-tasking view with what appears to be the equivalent of Spaces on the Mac. With Apple’s excellent track record of accessibility, I’m confident these features will have the same level of accessibility as the rest of iOS. I can’t wait to try out iOS 11 when the public beta becomes available to start enjoying some of these features on at least one of my devices (not the one I use to get work done, of course – at least not until late in the beta cycle when everything is much more stable). How about you – which ones of these iOS 11 features have you most excited? Which ones do you think you will use the most? Today’s post will focus on some of the lessons I have learned about the accessibility of ebooks created with iBooks Author and accessed on the iPad with iBooks 2. I was pleasantly surprised to learn that Apple included an option for adding a description for images and other objects when it released iBooks Author. I don’t remember this feature being discussed much at the event where Apple unveiled iBooks 2 and iBooks Author, and only found out about it while test driving the software. An even better surprise was learning that closed captions are now supported for any video that is embedded in an iBook. This is a great feature that will benefit a range of different learners (not only those with hearing disabilities). I think these new accessibility features of iBooks Author and iBooks 2 will go a long way toward facilitating the adoption of iBooks in the schools by meeting legal requirements for accessibility set by the U.S. government (for a summary of the legal requirements, please see the Dear Colleague letter and the follow-up clarification from the U.S. Department of Education). the article suggests adding descriptions for all images, including background images. Web accessibility guidelines state that decorative images should have a null or empty alt attribute so that they are skipped by a screen reader, but there is currently no way in iBooks Author to indicate that an image should be skipped by VoiceOver on the iPad. In my testing, I found that when you leave the description field for an image empty in iBooks Author, VoiceOver will read the entire file name when it comes across the image in iBooks 2. This is a problem because most people don’t use very descriptive file names before they add their images to a document. In my test iBook, I forgot to add a description for one of the placeholder images included in the iBooks Author template I selected. When I accessed the iBook on my iPad, VoiceOver read the following: “1872451980 image”. Imagine how confusing this would be to someone who is blind and relies on the VoiceOver screen reader to access content in iBooks. For the time being, I would suggest following the guidance from Apple and marking up all images, including those that are used for decorative purposes, but I would recommend marking up decorative images (those that don’t add any content that is essential for understanding) with the word “Background” in the description. By default, VoiceOver will say the word “image” so it is not necessary to add that to the description. While it would be better for the image to be skipped by VoiceOver if it is not essential, I would rather hear a quick, single-word announcement that is much easier to ignore than a long number read aloud in its entirety by VoiceOver, or an unnecessary description for an image that does not add in any way to my understanding of the content. as much as possible, image descriptions should focus on the function of each image rather than its visual appearance. Writing descriptions (or alternative text as it is more commonly known in the web accessibility world) is as much an art as it is a science, and much of it is subjective. There are many sites that provide information on how to write good alt text for images on websites, but I have found very little guidance on how to write descriptions for other online content such as ebooks. My recommendation would be to focus on three C’s when writing descriptions for images in iBooks Author: Context, Content and Conciseness. First, I would ask myself if the image is properly described in the surrounding text. If it is, then it might be more appropriate to mark it up as a decorative image (“Background”). Next, I would ask myself “what information does this image convey?” and focus on the key idea or concept supported by the image rather than its visual details. There could be a few exceptions where you might need to focus on the visual details of the image, but these cases should be the exception rather than the rule. The final consideration is to keep the description as brief and concise as possible. I would try to keep it to no more than 8-10 words if possible. 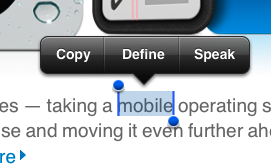 The second aspect of accessibility supported in iBooks Author is closed captioning. If a movie added to an iBook in iBooks Author has been captioned, you can view the captions in iBooks 2 on the iPad by going to Settings, Video and making sure Closed Captions is set to On. 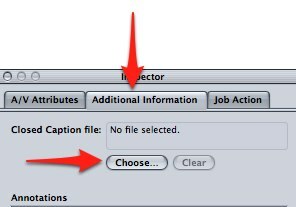 If you know a file has been captioned and you don’t see the captions on the iPad, you may need to go into the Settings app and turn the captions off and then on for the captions to show up. This appears to be a bug that will likely get fixed in a future update to iBooks or IOS. 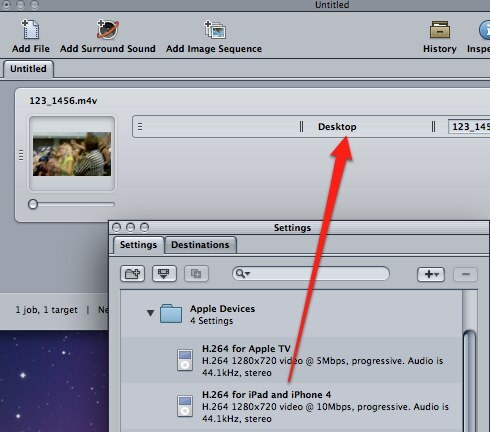 To create a captioned file, I have found that a workflow using MovieCaptioner and Compressor has worked well for me. I like MovieCaptioner for creating the captions because it is affordable and easy to learn. To learn more about how to create captions with MovieCaptioner you can view this tutorial I have made available on the Tech Ease website at the University of South Florida. 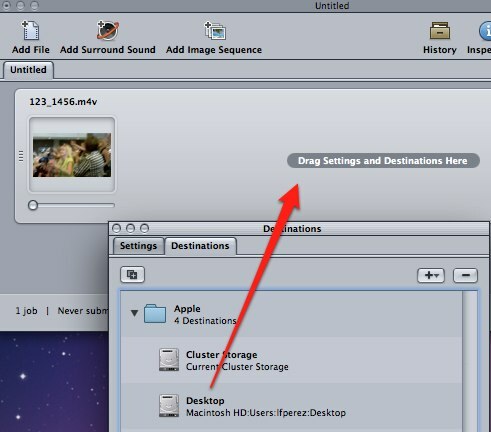 Open Compressor and choose Add File from the toolbar, then locate the desired video on your hard drive. In the Settings pane (Window > Settings) choose the Destinations tab, then find Desktop (or your preferred destination ) and drag it into the Batch window. Switch to the Settings tab and choose Apple Devices, H.264 for iPad and iPhone, then drag that setting on top of the destination in the Batch window. With your movie selected, open the Inspector (Window > Inspector or click the Inspector button on the toolbar), select the Additional Information tab and then Choose to find the SCC file on your computer. Select Submit to start the export process. Once your movie has been exported from Compressor you should be able to drag it right into your iBook in iBooks Author to add it as a widget. As with images, make sure you provide a description in the Inspector. Students with disabilities have traditionally had a difficult time with access to textbooks. iBooks Author provides a platform for making textbooks more accessible for all learners as long as a few accessibility principles are kept in mind. 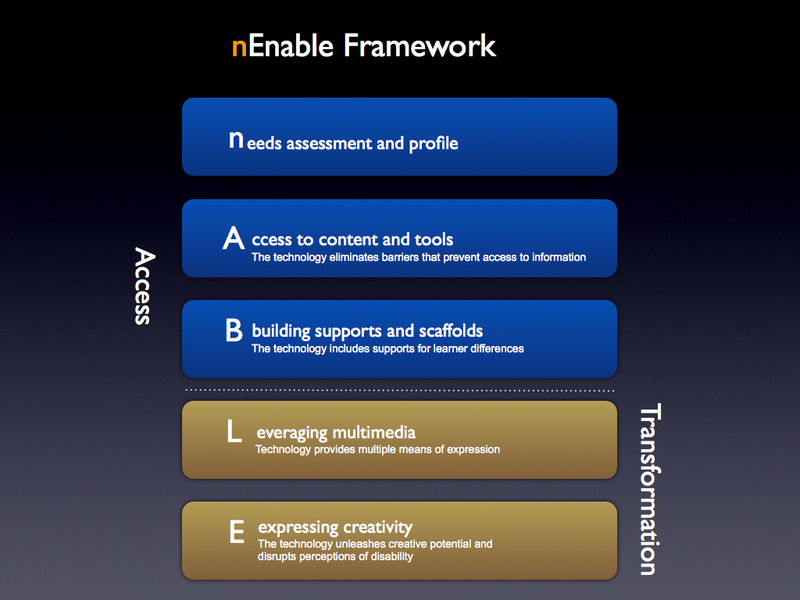 What an exciting time to be working in educational technology and accessibility!